Where to buy a hotel duvet? Right here, of course. When shopping for a duvet, look for it’s ‘tog rating’. This refers to how good the duvet is at trapping air and therefore keeping you warm. The higher the rating, the warmer the duvet is. Duvet togs range from as low as 3.0 for a light summer duvet through to 13.5 or more for a heavy duty winter duvet. 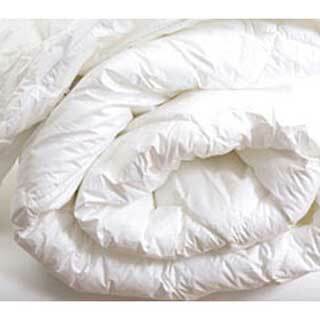 A 10.5 tog rated duvet is a popular option for the UK climate. Duvets are designed to be slightly larger than their corresponding bed. The duvet filling chosen will affect the weight, appearance and warmth of your duvet. Duvets filled with natural feathers or down tend to be lightweight and long-lasting.. Choose between goose or duck feather or down duvets. Natural duvet fillings tend to be more expensive than man-made materials. Synthetic duvets are usually made from polyester and tend to feel a little less luxurious than natural fillings. Hotel hollowfibre duvet 4.5 tog anti allergy. Superior Quality Poly/Cotton Outer Cover - BS 5335 (1991) - Anti-Allergy - Perfect for sufferers from allergies, asthma and eczema. Provides permanent dual protection against dust mites and bacteria. Very good quality hollowfibre filling which washes and wears well. Designed to bounce back to natural fullness after use. Recommended highly for quality and durability. Hotel spring back hollowfibre duvet 10.5tog anti allergy. Superior Quality Poly/Cotton Outer Cover. BS 5335 (1991). Anti-Allergy. Perfect for sufferers from allergies, asthma and eczema. Provides permanent dual protection against dust mites and bacteria. Luxurious 100% spring back super fine hollowfibre filling. 68pic 50/50% polyester-cotton cover. Channel stitched. Bias bound edges. 10.5 tog. Designed to bounce back to natural fullness after use. Recommended highly for quality and durability. Contract/hotel quality. Manufactured in the UK. Also available in 4.5 tog, 13.5 tog and 15.0 tog. Hotel hollowfibre duvet 13.5 tog anti allergy. Superior Quality Poly/Cotton Outer Cover - BS 5335 (1991) - Anti-Allergy - Perfect for sufferers from allergies, asthma and eczema. Provides permanent dual protection against dust mites and bacteria. Hotel hollowfibre duvet 15.0 tog anti allergy. Superior Quality Poly/Cotton Outer Cover - BS 5335 (1991) - Anti-Allergy - Perfect for sufferers from allergies, asthma and eczema. Provides permanent dual protection against dust mites and bacteria. 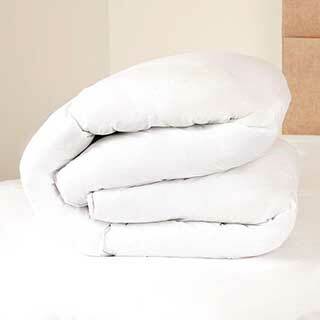 Natural duvets are softer and lighter and mould to the body shape. The very best quality contract feather and down duvets. Supplied to high end hotel groups these have a messentex anti bacterial treatment which means they are ideal for allergy and asthma sufferers. 85% Duck Feather and 15% Duck down filling. Pocket stiched ensuring even distridution for warmth & comfort. Fetaher and down is the natural choice and wonderful to sleep under, and unlike hollowfibre, is virtually indestructible with washing. Covered with a 100% cotton cambric cover and are pocket stitched to hold the filling in place. Microfibre is a revolutionary light and fine polyester hollowfibre, which is air-blown into the duvets outer casing for a better loft and softness. It is designed to imitate the look and feel of a goose down duvet. The outer cover is made from microfibre with diamond shaped stitching. 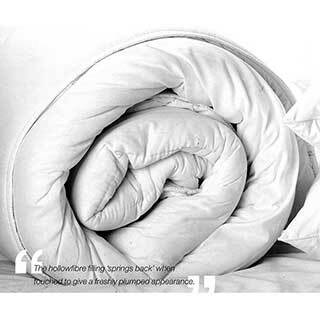 The duvet has a sumptuous 'bounce back' filling that keeps it's shape as if it were new. Microfibre is a revolutionary light and fine polyester hollowfibre. 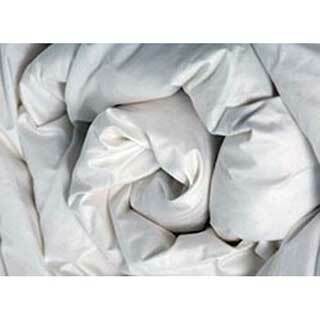 A luxurious duvet providing the softness of down with all the benefits of a synthetic filled duvet. The boxed style construction offers a superior look on the finished bed. 10.5 tog. 100% fine soft polyester microfibre hollowfibre filling. 100% cotton outer cover. Boxed construction. Microfibre is a revolutionary light and fine polyester hollowfibre. A superior quality duvet made from 100% hollowfibre polyester fibre filling. The hollowfibre filling 'springs back' when touched to give a freshly plumped appearance. Holowfibre filling for constant comfort. Non allergenic. Cover 50% cotton 50% polyester (140 thread count); filling 100% polyester. Channel stitched. Bias bound edges. Available in: Single (137x198cm) Double (198x198cm) King size ( 225x218cm) Super King (259x218cm) and Zip & Link (137x198cm each). Manufactured in the UK. Two single 13.5 tog duvets which can be zipped together to make a super king size duvet. Non-allergenic. Luxurious hollowfibre filling springs back when touched to give a fresh plumped apprearance. Contract/hotel quality. Manufactured in the UK. Space saving - no need to have to store either the two single duvets or the one super king size duvet. Two single 10.5 tog duvets which can be zipped together to make a super king size duvet. Non-allergenic. Luxurious hollowfibre filling springs back when touched to give a fresh plumped apprearance. A sumptuous, plump duck feather duvet which has a 13.5 tog rating suitable for winter. The cassette construction helps to keep the natural filling in place to eliminate cold spots and provides warmth without weight. 85% Duck Feather/15% Down Filling. Cotton cambric cover. Casette construction and piped edges. Feathers breathe, so you stay warm in winter and cool in summer (unlike synthetic fibres) The down clusters retain the natural body heat, so you have warmth without weight. Down is virtually indestructable, unlike hollowfibre which breaks down with continual laundering. A sumptuous, plump duck feather duvet which has a 10.5 tog rating. The cassette construction helps to keep the natural filling in place to eliminate cold spots and provides warmth without weight. 85% Duck Feather/15% Down Filling. The outer cover is made from microfibre with diamond shaped stitching. The duvet has a sumptuous 'bounce back' filling that keeps it's shape as if it were new. Our super luxury microfibre filled zip & link duvet is a synthetic filled top of the range duvet. The synthetic microfibre filling caters for allergy sufferers whilst creating a luxuriously restful sleep for your guests. The outer cover is made from sumptuously snug 100% microfibre peachskin. The microfibre filling is is a siliconised microfibre blend making it soft and luxurious. Each duvet measures 140x200cm (55x78"). Overall size 280x200cm (110x78"). Microfibre is a revolutionary light and fine polyester hollowfibre. This filling is the nearest in feel to a natural down filling, giving the effect of down and the sumptuousness and lofty look of down. Our super luxury microfibre filled duvets are a synthetic filled top of the range duvet. The synthetic filling caters for allergy sufferers whilst creating a luxuriously restful sleep for your guests. The outer cover is made from sumptuously snug 100% microfibre peachskin. The microfibre filling is is a siliconised microfibre blend making it soft and luxurious. Just like down filling, a super luxurious 10.5tog duvet providing the softness of down with all the benefits of a synthetic filled duvet. The channel stitched style offers a superior look on the finished bed. Microfibre is a revolutionary light and fine polyester fibre, which is air-blown into the duvets outer casing for a better loft and softness. It is designed to imitate the look and feel of a goose down duvet. 10.5 tog. 100% fine super soft polyester microfibre filling. 233 thread count 100% cotton outer cover. Channel stitched construction. Non-allergenic. Machine washable. Hotel Egyptian cotton duvet is made from the finest pure Egyptian cotton, designed to promote a cool, comfortable and super soft night's sleep for your guests. 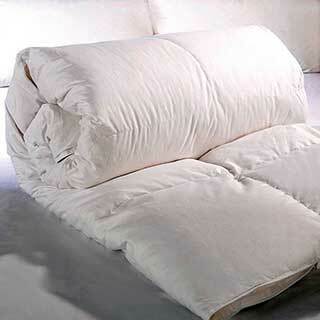 Complete with a superfine hypoallergenic hollowfibre filling which makes the duvet lighter in weight. Washes and wears well. Designed to bounce back to natural fullness after use. BS 5335 (1991) - Anti-Allergy - Perfect for sufferers from allergies, asthma and eczema. Provides permanent dual protection against dust mites and bacteria. Recommended highly for quality and durability. 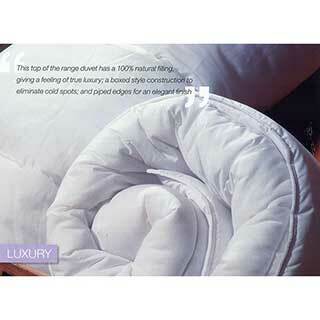 Luxurious and soft microfibre duvet which feels just like down. Ultra-fine polyester microfibre filling. Soft touch finish with 230 thread count microfibre cover. Channel stitched with bound edges. Non allergenic and machine washable at 40° C. Manufactured in the UK.